An extra 3m of boulders was installed at the corner bend to stabilize the bank and reduce the amount of erosion occurring at this site. Manitoulin Streams-Blue Jay Creek & Manitou River Enhancement Strategy, a large scale initiative to rehabilitate the aquatic habitat of these streams. 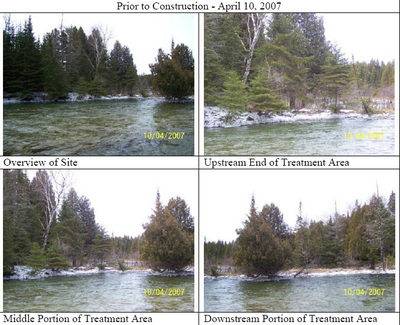 Assessment, engineering & site design was conducted to improve and protect fish habitat features in the lower reaches of the Manitou River. Improvements needed to be implemented on Site M-02 as identified in the strategy. Documented stream bank erosion was evident by the meander cutting into the unprotected bank. The significant erosion was subsequently infilling downstream pools and covering high quality spawning substrates with sediment, thus reducing the total available critical fish habitat features. 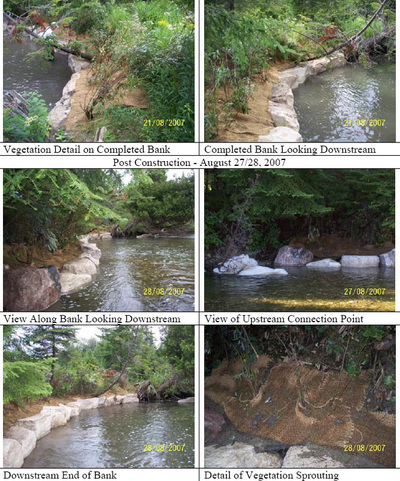 Therefore, the objective was to repair erosion at the outside bend and create cover for a shallow pool (<0.6m) at this site and downstream spawning substrate. Large boulders were placed along the corner bend to add support and reduce erosion from occurring. The boulders also provide habitat for juvenile fish and aquatic invertebrates to use. Along these boulders placement of clean, smooth ½” average diameter, glacial origin spawning gravel to a depth of 0.3 m was placed over an area of approx. 200 m2. 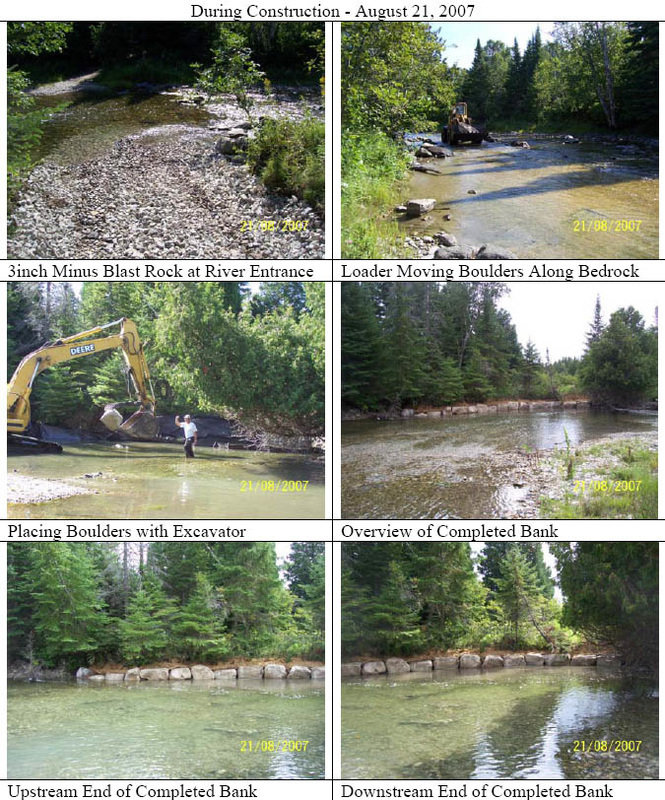 This project had up to 19 volunteers from Manitoulin Streams working on this project at various times. A total of 60 volunteered hours was dedicated by “Manitoulin Streams” committee members attending meetings to discuss planning procedures. Manitoulin Streams had numerous meetings and email communications to discuss the details about this project including sending out Site Design Request for Proposals, Tenders, and Site Supervision to ensure proper delivery of site design and issuing a winner of the bids. Overseas communication (by phone and email) with the landowners had to take place in order to rehabilitate this site. Also, meetings with employees of the Royal Michael’s Bay Resort on behalf of the landowners to gain access to the property for site rehabilitation took place. A Grade 12 student from Germany volunteered 30 hours to conduct invertebrate sampling at various sites along the Manitou River to gain baseline information about the diversity of invertebrates before rehabilitation efforts take place. Future studies at this site will determine if there is an improvement as a result of the rehabilitation of M2. The Lake Manitou Area Association volunteered 5 people to transplant 231 trees and shrubs once the boulders were installed. These trees will provide shade/cover as well as leaves and debris that will increase habitat and provide a food source for the beginning of the food chain (i.e. invertebrates, fish). A total of 21m of shoreline was repaired. The work was completed according to the site plans through the cooperation of the landowner, consulting expertise of Great Lakes Environmental Services (GLES) and equipment, material, and services of C. Pearson & Sons Ltd. Funds from various sources were used to complete this project from DFO for site design, CFWIP and COA funding for rehabilitation construction work completed and from Eco-Action for Site Supervision by a certified engineer. Erosion of the stream bank had caused sediment to be displaced down stream over critical fish habitat and there was a potential of the corner bend breaking through to the other side of the river and changing the course of the river.